When you buy computers, electronics or appliances, you will likely be asked if you’d like to get an extended warranty for it. This is common practice upon check out at many stores. It seems like it might be a good idea because you worry about what happens if it breaks. Will you have to buy a new one? And how expensive will that be? However, the reality is that extended warranties are rarely worth the money. So, don’t give in to the fear that comes with the sales pitch, and just say no. Most products are unlikely to need repair during the extended warranty period. They will either have a manufacturing defect that can be replaced during the manufacturer warranty or may need repair due to age or wear and tear well after what the extended warranty will have covered. The cost of repairing the item may be similar, or even less, than the warranty itself. With advancements in technologies and constantly dropping prices in computers and electronics, it may be worth replacing the item if it’s been 2 or 3 years since you’ve purchased it. For example, 2 years ago someone could buy a DVD player for $200 and an extended warranty for $50 extra. But if they skipped the warranty and now the DVD player isn’t working, they could simply buy a new Blu-ray player for that same $50… and now the new Blu-ray player includes new features like DVD up conversion and a USB port. Everything may not be covered under the extended warranty. Certain parts might be excluded or labour and shipping may have to be paid by you. Many gold and platinum credit cards will double the manufacturer’s warranty, up to a year, if you purchase the product with that card. No need to get an extended warranty at all when you have the right credit card. In many cases, extended warranties are a waste of your money. If you are really concerned about it, consider setting up a small emergency fund to help you pay for repairs or replacements down the road. This can be more effective overall, and at least you can earn interest. If you do decide to get an extended warranty, negotiate the price or try to get something included with your purchase. Don’t just pay the warranty price and move on. For example, when buying a TV with an extended warranty, you may be able to get your HDMI cables or a DVD player thrown in. Most companies have quite a bit of room to deal since they keep at least 50% of the price of the warranty. The point of an extended warranty is to give you the illusion that you are getting added value. However, unless you can negotiate a lower price, or some extra freebies, you aren’t seeing added value at all. Re-think the need for extended warranties, and consider how you can put that money to better use in other ways. I dont really buy the extended warranty from the retailers, but I get them from the manufactures. When it comes to electronics I think having the extra protection is important. I purchased a laptop from best Buy in 2006 and got the warranty from HP about $500, What I liked about the HP warranty is that it covers everything except fire and theft. including physical damage and water damage. in dec 2008 my laptop fell of the stairs I sent it in and got a new Laptop worth $1200 (original laptop was $1100). Currently this laptop is giving me problems as well so it will go back in for repair. I’ve had very good experiences with buying extended warranties on vehicles – saved hundreds of dollars on major repairs. But I don’t bother with extended warranties on other things for the reasons you mention. I had to laugh the other day at the store. I was buying a $25 Fisher Price toy for my one-year-old niece’s birthday. The clerk asked if I wanted to purchase a 2-year extended warranty for it! The kid will outgrow the toy before the warranty is up. Just shows that companies will try to squeeze whatever money they can from consumers! 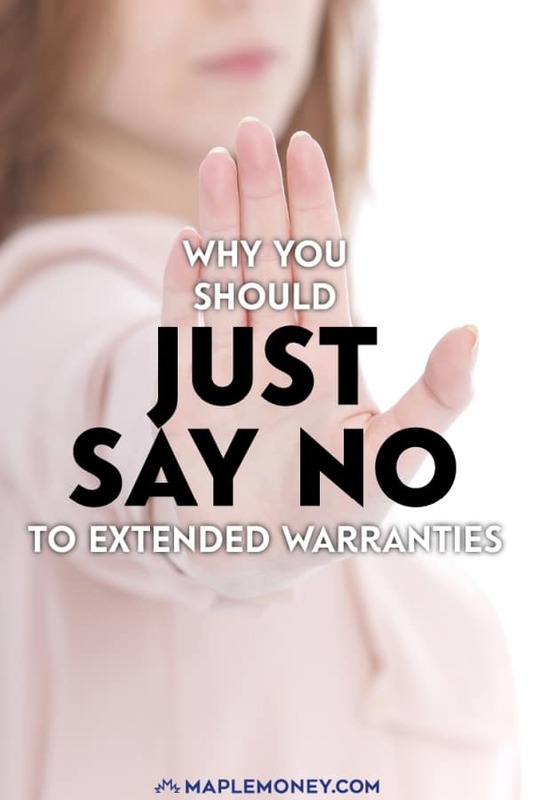 I find that your first reason is the biggest why extended warranties are unnecessary – if something is to go wrong, it most likely will during the time frame of the manufacturer’s warranty. But let’s not forget all those people who just lose their receipts, making that extra warranty useless – which is most of us! I agree with this completely. Especially for electronic stuff. Most electronics either break right away or will last an EXTREMELY long time. Lately some big retailers have had deals where you buy an extended warranty, but if you don’t use it during the warranty period you get the money back in the form of store gift cards. I know Sears does this with washers & dryers, for example. When I was young we did this on our first TV we bought as a couple. One week later, electronics store went out of business – and they were the ones holding the warranty. There went my money back warranty. Never buy a warranty. 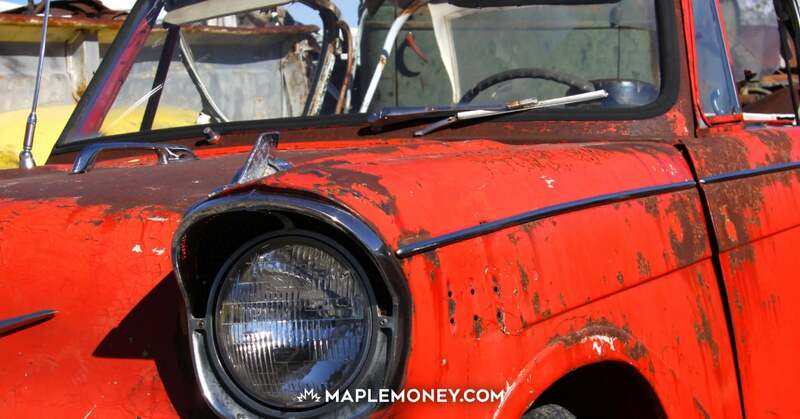 The word warranty is code for ‘insurance you don’t need and are going to overpay for’. Better to self-insure for small purchases. Only insure something if the cost of repair or replacement would cause financial problems. With any type of insurance you have to pay markup. If the payout is going to be $25,000 that people don’t have lying around, that’s worth the markup. For a $500 item that you’d expect to be able to purchase another one without real hardship, skip the warranty, take the risk, and pocket the warranty company’s profit. Ray’s example is good. He paid almost 50% of the product to insure it? Does that mean they expect almost 1 in 2 products to fail completely? If not, why are you paying that level of premium? I believe in extended warranties when it comes to appliances. We purchased a new stove & fridge a year ago this month (Aug) and took out a five year extended warranty on both. So far we’ve had to replace the glass stove top and the low heat burner. The motor on the fridge had to be replaced as the bottom freezer stopped doing its job and now about two weeks later after being replaced, there is ice building up on the bottom of the freezer below the baskets and when the fridge goes into defrost mode, this ice melts and is leaking on the floor! So another service call. Appliances are not made to last like they were years ago. We had our old fridge for thirty years and never had a moments problem with it and only had to replace the oven element and a burner or two during those years. If we had to pay for all these service calls it would be very costly. That’s why I believe in extended warranties.